The Organic tables offer the same crank height sit-to-stand worm gear mechanism as the Generation IV series. The graceful lines create flowing surfaces that can increase posture comfort and reach envelopes. All tables can be upgraded by adding a motor to the table frame. Note: Only available with vinyl waterfall edge. 48" bilevel table. 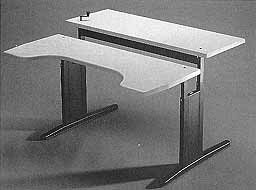 Use as stand alone or in workstation configuration.